When you need to ship art, photos, magazines, portfolios, comics, or any product that requires a sturdy foundation, eSupplyStore.com has everything you need! From bubble wrap mailers to corrugated boxes, from tape to shrink wrap, we provide all the supplies and accessories you need to make sure the products you’ve worked so hard to sell reach your customers in the best shape possible without crippling your bottom line. Our prices allow you to maximize both your profit margin and your product’s impact on the customer. We’re your one-stop shop for mailers, and chipboard pads to stiffen them -- keeping your product sleek and ready to impress your customers. 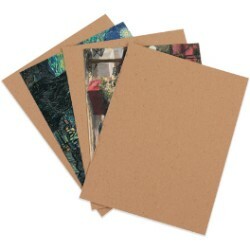 Our chipboard pads are the most reliable and inexpensive way to keep fragile booklets or art flat, or you can use them as a top layer in your packing cartons to keep your product safe from cutters and knives. These chipboard pads are made from high-quality kraft fibreboard and are offered in a wide range of sizes from standard 8 ½” x 11” to the largest 26” x 38”. Our satisfaction guarantee and same or next-day shipping make sure you never have to wait long to have all your shipping solutions at your fingertips. Choose from the many sizes and quantities available below to begin your easy ordering process, and don’t forget to look over all of our top quality, discount cost supply and accessory options for any and everything your shipping department may need! Our www.eSupplyStore.com Customer Care team is standing by to answer your questions or assist you in placing your order at 866-437-8775 (toll free).